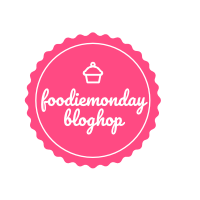 When Poonam, who blogs at Annapurna suggested Cook from a Cook Book as our #135 theme for FoodieMonday/Bloghop group, it was definitely time to get those books off the shelf. As fellow member Amrita commented, it gives us the opportunity to do some serious reading. I have so many cookbooks but majority are by Tarla Dalal. I was so tempted to just open one of the books and cook from her collection.However, I had to deviate from my comfort zone. As I was going through the books, I came across Hamlyn All Colour Cook Book. How could I forget this book? It was one of the first cookbooks I had from my family which had International dishes. At 18 I would stare at the beautiful pictures (modern cookbooks have better photos these days) of the dishes prepared. Some names I had heard for the first time and some were familiar. Can you imagine the joy of owning an International Cook Book back then? When I got married, the book along with some of Tarla Dalal books came along with me to the new home. Back then never thought that the book would have limited use for me as there are so many non vegetarian recipes in it. However, the baking recipes, salads and desserts are what I would try out when there no internet and zillions of food blogs. Nowadays we forget to open these cookbooks and straight head for the internet. After my trip to Watamu, I came back home with 4 dry baguettes. The family and I were staying at a villa in Watamu and a cook would prepare our meals for us. The only thing we had to do was to provide him with the ingredients. I went with some from Mombasa and some my kaki brought from Nairobi. The left over baguettes were not going to be flown back to Nairobi and I had to bring them home. As I tried to slice them, they bread would just crumble. Whizzed the pieces in a food processor to make bread crumbs and stored them in the fridge. Saturday is when I’m going through the cookbook, wanting to make a dessert and I come across the recipe for Scandinavian Apple Charlotte. It was a huge ‘yes’ and ‘punch the air with my arms’ moment as I could use some of the bread crumbs. A Charlotte is a dessert or pudding where cookies, sponge cake or bread slices are lined in a pudding bowl and fruit puree or custard is added in the middle and baked. The pudding is served hot or cold. This Scandinavian version, a recipe by Mary Berry is quite different. Easy to make and so deliciously refreshing. 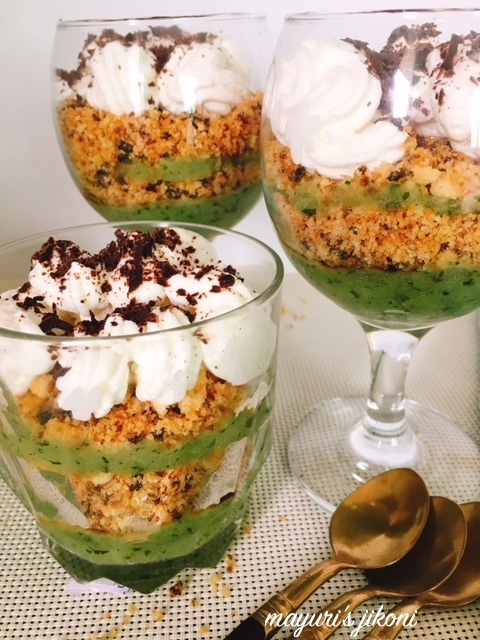 The original recipe does not mention food coloring but cooked green apples are not green so colour must have been added for a better photography. To add a bit of green I used a handful of fresh mint(I just couldn’t resist adding my own touch!). The combination of fresh mint and cooked green apple is very delectable. When I layering the dessert, I thought that the puree was not enough. However, on tasting the dessert, I realized that the amount was just right. 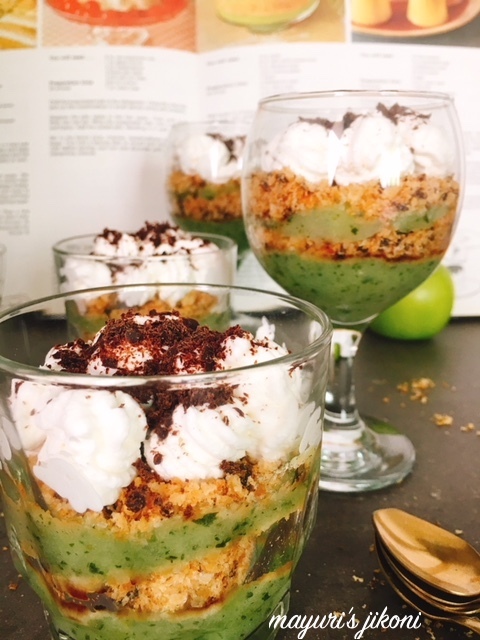 Green apple puree can be a bit tart, so the balance of the sweet crumbs and tart puree was perfect. My Cook Book that I’ve had for nearly 38 years! Add the chopped apples, sugar and water in a saucepan. Cover the pan with a lid and place it over low heat. Let the apples cook till done. Check occasionally to make sure the mixture is not burning and to stir it. Let the cooked apples cool down completely. Add the cooked apples and mint into a food processor and process it to a fine puree or a coarse puree. I left it a bit coarse. Gently heat butter in a wide pan over low heat. Add the bread crumbs and mix. Increase the heat to medium and stir the breadcrumbs constantly till they become golden brown and are crispy. Add sugar and mix well. Let the mixture cool down. Add the cream to a deep bowl. Whip till it reaches soft peak consistency. That means that when you lift the whisk, it leaves a soft peak. You can use one big bowl or 4 individual bowls or glasses. Spoon about a tablespoonful of the puree into the glasses. Gently tap the glasses on the surface on which you have laid out a thick towel. Be sure to follow this step otherwise you may land up with broken glasses! Next sprinkle a thick layer of the crumb mixture. Top it will remaining apple puree. Then add the crumb layer again. Finally top it with whipped cream and sprinkle some grated chocolate. Chill the dessert for 2-3 hours before serving. If you’re using one big bowl its easy to just divide the puree and crumb into 2 parts. For individual servings you roughly need to divide the puree and crumb into 8 parts. Add a bit of mint green colour to the puree if you’re not going to add mint. To prepare bread crumbs at home, just process old bread into a food processor. Then let it become a bit crispy by baking in the oven @100°C – 150°C for 15-20 minutes. Store in an airtight tin or ziploc bag in the fridge. The original recipe had measurements in ounces. I just converted it to the more friendly cup and tsp, tbsp measurements. Its best to keep the bowl in the fridge that you’re going to use for whipping the cream. Cold bowl and cold cream fluffs up faster. Wow! What a beautiful looking dessert. Lovely share Mayuri. I would love to try this amazing recipe. You have done full justice to the theme di…such a delightful dessert ! I am sure the apple Charlotte tastes great . Love all the layers and colors in this dish! Beautiful photography! This is so awesome….just wowed by the post!I have not seen many Scandinavian recipes and this is so different and so delicious looking! This looks so tempting, want to dig in a spoon just now, lovely recipe share. Looks delish. I am also a cookbook hoard and your post reminds me to dust off some cobwebs from my collection too. That is such an inviting dessert. 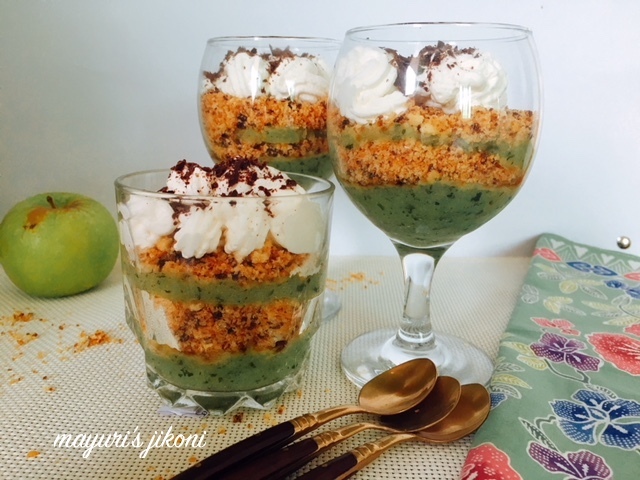 Love the layers of crumbs, apple puree and the creamy topping. I love that this is made as individual desserts — making it easy to serve. I love reading Cookery books. Once in 15 days, I remove all my books from the shelf and used to spend time all alone for at least 1 – 2 hours.. Seriously, it gives so much motivation to cook! Loved your version of Charlotte.. Looks amazing and perfect for parties ! A cool recipe. love the fact that it has mint too. Looks delightful. What great way to use apples in our diet. Awesome. Looks so yummy been wanting to see since I saw pics on FB. Loved the write up and agree that we sometimes don't pay attention to the cookbooks available with us and resort to internet for recipes. Cookbooks were the only source of recipes and photography inspirations back in time. I still love scrolling through them instead of internet and find them inspiring. The way you have managed to nail the recipe with the presentation exactly like the book is praiseworthy. Kudos to the wonderful theme idea by Poonam and your inspiration from the baguettes that were crumbly and gave you the idea for the innovation. Beautiful dessert cups.. Looks stunning.. I want one right away..
Scandinavian apple charlotte sounds interesting Mayuri, perfect for a get together as this can be made ahead to save time. Beautiful looking dish.. love the colourful layers. Looks so lovely. 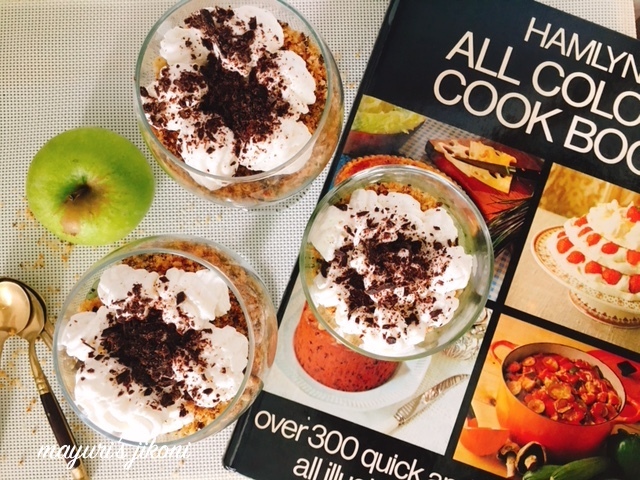 Omg, how tempting those Apple charlotte looks and am in love with this single serving desserts. Wish i get a serving for me to please my sweet tooth. Wow apple charlotte looks like a wonderful treat. Lovely pictures Mayuri. Recently I got a craze to collect cookbooks. But this desserts looking absolutely mouthwatering. Bookmarking now. The first cookbooks in collection always have some fond memories!! This pudding is sure a party pleaser!!! This is awesome !!! 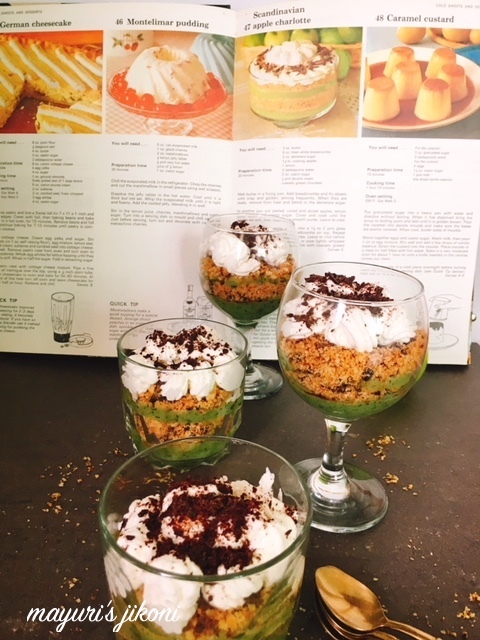 Love this yummy dessert so beautifully presented.I am amazed at your cookbook collection for 38 yrs. These look to die for, and all the layers seem to be extremely delicious and fantastic! Loved this!! !